Long Handled Grooming Utensils - Grooming Set. 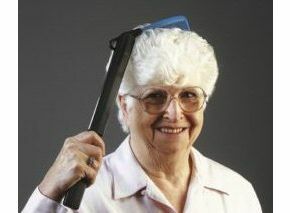 These long handled grooming utensils assist those who cannot raise their arm or reach behind their head to comb their hair. 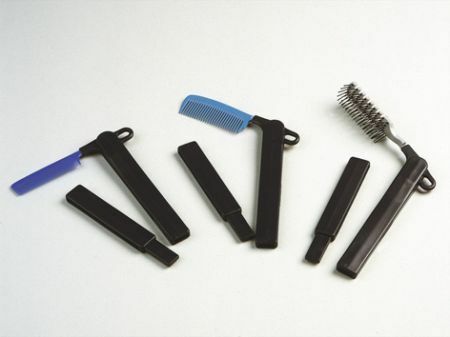 They consist of a lightweight moulded plastic handle with a push-on extension piece, and a hinged end piece which holds the comb or brush and has two different angled positions. When not in use, the comb or brush folds back into the handle and the extension can be taken off to give a pocket sized item. Length: With extension 460mm (18") - With handle 320mm (12½"). I needed this comb urgently as the one I had was in my suitcase that was stolen from a National Express coach when going on holiday and was delighted with the quick delivery - only 2 days. These are excellent combs for people like myself who cannot reach their hair with a normal comb. Don't know how I'd manage without one.